Sometimes there are events which compel you to take action. The tragedy of Meethotamulla is one such. In spite of all the available knowledge on solid waste management and all foreign sites visited and workshops attended by officials, a mountain of garbage was allowed to collapse on a community killing many people, right in our backyard in Colombo. Since the tragedy, several of us have been brainstorming what we could do besides occasionally writing about the topic or wringing our hands in frustration. After many discussions we decided to get more organised, because the status quo may continue if we don’t. The campaign was formalised on 14 May in recognition of the one month anniversary of Meethotamulla. It is a joint effort by LIRNEasia, Sarvodaya and the Federation of Sri Lankan Local Government Authorities to find solutions for disposing our waste without harming people or the environment. There are many commendable efforts to reduce, reuse and recycle waste at the source, but very little attention is paid to the regulation of waste disposal sites. The campaign hopes to fill that void. The present partnership is only a start. We need other like-minded individuals and organisations to come on board. Following is a working set of goals, objectives, and activities. The ultimate goal is it to ensure that we have the infrastructure and regulatory framework, at national, provincial or regional level, necessary for sustainable solid waste disposal. Goals are lofty ideals. Measurable objectives help one stay on course. The short-term objective being considered by the campaign is to ensure that waste is disposed without causing harm to the people or the environment in at least one local authority by 14 April 2018, one year after the Meethotamulla tragedy. We are confident of achieving this objective because some local authorities already have access to more or less sanitary landfill sites. Our partnerships allow us identify bottlenecks at provincial or national level, help to introduce new by-laws as necessary, and have an active civil society to monitor the progress in a selected set of those. The lessons we learn about policy, political, administrative or social barriers to the proper disposal of waste in these local authorities will be invaluable for our long term goal of a more comprehensive solution. Why focus on solid waste disposal? During 2008-2010, LIRNEasia carried out an action research project on ‘knowledge to innovation in solid waste management at local authorities in Sri Lanka’. The project was centred on the 3R concept or the “reduce-reuse-recycle” concept, and the science, technology and police issues around it. A valuable lesson we learned through our research is the need to balance 3R initiatives with final-disposal facilities for waste that cannot be recycled. Every country, even Sweden (the current exemplar in solid-waste management) began with zero recycling and 100% landfilling at some point, and progressed to higher levels of recycling and lower levels of landfilling. Zero waste is a lofty goal which developing countries should approach sensibly, keeping in mind the natural increase in the consumption of goods and service by the poor as they raise themselves out of poverty. Therefore we need space to dispose our waste, but we need to do that sustainably so that we don’t harm the environment or the people in the vicinity. During our action research project we found many innovations in smaller local authorities in Balangoda, Weligama, Kuliyapitiya and attempts by pockets of officials and civil society organisations at the local level. A network of committed individuals emerged, but overtime, other priorities took our attention. Streets were getting cleaned, garbage was picked up and mountains of garbage were out of our sight. It is time to renew our networks we felt and hence the Campaign for Sustainable Solid Waste Disposal. The priority at this point is to identify a hierarchy of responsibility and accountability for solid waste disposal. There was no single authority accountable for the Meethotamulla tragedy. It was outside the jurisdiction of the CMC. But why was the council allowed to dispose waste unsafely in a populated area? Why weren’t they provided with alternative facilities? In the future, which Government entity should be responsible and accountable for waste disposal facilities? What other entities should be part of the solution? What are the modalities? To answer these questions we will be convening a panel of experts and others who can contribute to the discussion at a session scheduled for the late afternoon on 2 June. Additionally we will also work with three to five local authorities to identify and correct to the extent possible, any bottlenecks they face in the disposal of their solid waste. The output of these discussions and local level activism will be policy proposals presented through policy briefs, videos, dedicated web site and face to face meetings with policymakers and the general public. The more important output is of course a change in solid waste disposal practice in at least one local authority. The rest of the sessions will be dedicated to more technical issues such as disposal of bio-degradable waste or non-biodegradable waste, waste to energy options and landfilling, and the socio-economic issue of unsanitary working conditions and other problems faced by solid waste workers. Biodegradable waste, when landfilled or dumped, causes the most harm to communities and the environment. They are the components in the waste that leach out liquids as they degrade, cause stench and give out gases that can cause explosions or cause global warning. If we can separately collect discarded kitchen scraps or food waste, the rest of the waste is manageable. The issue is how do we process the biodegradable waste safely and productively? Home or institution based composting is an option but in urban environments we have to look at mass-scale options as well. Non-biodegradable waste such as paper, plastics, polythene, glass and metal waste is increasingly portrayed as a valuable resource. 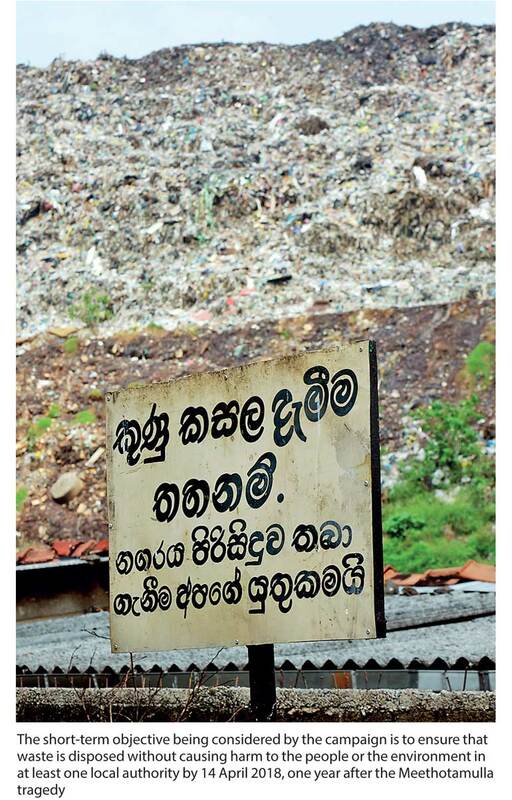 What other non-biodegradable waste is generated in Sri Lanka? How much of all such waste generated is recyclable? What shall we do with the rest? There is much mystery surrounding waste-to-energy options in solid waste disposal. What are the available options and how do we select the best? Sanitary landfills are indispensable for in solid waste management process since no waste is hundred percent recyclable, but, how do we make landfills more community or environment friendly? We hope to address these and other technical issues by bringing together experts and those with experience in each filed. Solid waste workers are the foot-soldiers who pick up our garbage and keep our surroundings clean, but their vocation is not viewed favourably by society. This situation cannot continue. If we are to dispose our waste sustainably, these workers have to be more than passive receivers of garbage. They will have to educate their customers to manage the waste at the source, i.e. at homes and institutions. As part of our action research, LIRNEasia also worked with the Tertiary and Vocational Education Commission of Sri Lanka to develop National Vocational Qualifications (NVQs) to develop solid waste workers as solid waste operations assistants and supervisors. The Solid Waste Management Training Centre at the Balangoda Urban Council has trained and certified over 1,000 workers since then. The Association of Solid Waste Management Assessors at Local Authorities was initiated by LIRNEasia as an association for knowledge sharing and collaboration. In the present campaign we will work with that association and others to expand the ongoing training and certification of solid waste workers, thereby filling the human resource gaps in solid waste disposal.